Here’s what’s up in the world of TV for Sunday, April 21. All times are Eastern. 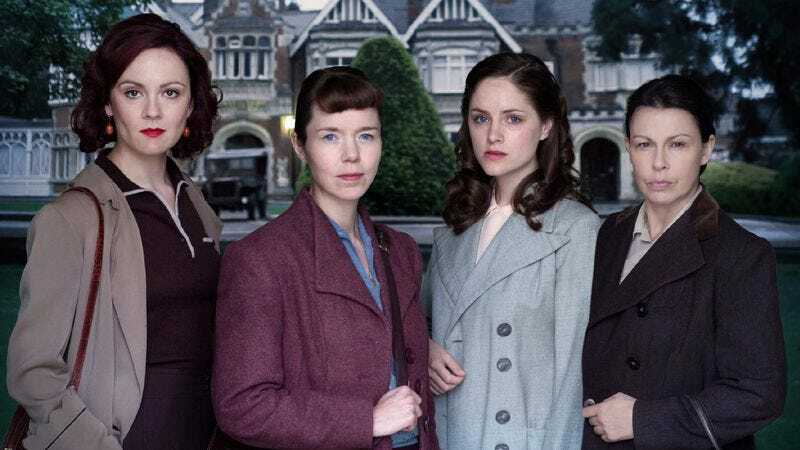 The Bletchley Circle (PBS, 10 p.m.): British-made period dramas still abound every Sunday night on your local PBS affiliate—did you know that there’s a second series of Call The Midwife? Or that it’s already been airing for three weeks?—but some TV Anglophiles are likely still stinging from the fairly recent loss of The Hour. Never fear, for British espionage set in the past survives in the form of The Bletchley Circle, a murder mystery set among code breakers in the 1950s. For code breakers in the 2010s, Sonia Saraiya has the following message: It’s a cold day for pontooning. Once Upon A Time (ABC, 8 p.m.): The TV Guide synopsis for tonight’s episode mentions Belle by name three times, so we’re going to guess it’s a highly Belle-centric hour. Either that or the magazine is trying to conjure the character Beetlejuice style—a trick that actually works if you call out Oliver Sava’s name thrice. Bob’s Burgers (Fox, 8:30 p.m.): This week marks Rowan Kaiser’s swan song in this space, an occasion the Belcher children mark by throwing him a casino-themed party in the basement of their parents’ restaurant. At least that’s what they told Rowan as he dragged a slot machine down two flights of stairs. The Good Wife (CBS, 9 p.m.): Everything wants Alicia to do something for them this week—Peter wants her participate in a vow renewal, her mom wants her to take on a specific case—but why can’t she just be The Good Wife for herself? David Sims knows the feeling all to well. Game Of Thrones (HBO, 9 p.m.): If a “watch” was something the Westerosi wore on their wrist and not something that protected them from invaders, thieves, and other enemies, then “And Now His Watch Has Ended” would be a deliciously macabre joke on the conclusion of “Walk Of Punishment.” David Sims and Todd VanDerWerff really have to hand it to us for that bit of wordplay. American Dad (Fox, 9:30 p.m.): On the hunt for a terrorist, Stan suffers a bout of amnesia. Don’t worry show: Kevin McFarland knows how to fix this. Where do you keep your largest novelty-sized sledgehammer? Mad Men (AMC, 10 p.m.): Mum’s the word about a new campaign at Sterling Cooper Draper Pryce—so Matthew Weiner’s insane veil of secrecy surrounding his show has finally bleeding into the plots? Todd VanDerWerff wouldn’t knows as much as anyone else—which is nothing. NOTHIIIIING! Veep (HBO, 10 p.m.): After the luau on Mad Men and a pig roast on tonight’s Veep, we’re ready to name pork the hot new TV trend for 2013. Robert David Sullivan’s hoping that means a Green Acres revival centered on Arnold Ziffel is in the offing. Vikings (History, 10 p.m.): If, as it just occurred to us, you mistake this series as a chronicle of the Vikings that make their home at the Hubert H. Humphrey Metrodome, then you might also assume that “Lagertha seeks answers from the gods” stems from those other Vikings’ decades of playoff woes. Little known fact: Dennis Perkins is, in actuality, Super Bowl IV MVP Len Dawson. The Borgias (Showtime, 10 p.m.): Revenge against disloyal cardinals: Just another day in the life of history’s most vengeful, lustiest pope. One day, Les Chappell hopes to be named history’s most stylish pope. Farscape (11 a.m.): Crash landings, accidental wormholes, species-specific mental illnesses—it’s our uninformed opinion that Farscape just might be TV science fiction’s most incident-packed series. Alasdair Wilkins misses the days when the genre was inexplicably obsessed with trade agreements and tariffs. The Simpsons (Classic) (3 p.m.): Bart witnesses a crime—but you didn’t hear that from us. Or from Nathan Rabin. In fact, forget that you heard anything about this episode. Dog And Beth (CMT, 8 p.m.): Oh Dog the Bounty Hunter: You know television can’t quit you! And neither can the less-famous bondsmen and bounty hunters who you’ll be advising in this new docuseries. Guntucky (CMT, 9:30 p.m.): Good news! Thanks to the staunch, 2nd Amendment-protecting patriots of the U.S. Senate, you don’t need to go through a background check to watch this show! Ice Cold Gold (Animal Planet, 10 p.m.): An important geography lesson, gleaned from D2: The Mighty Ducks and adapted to fit the premise of Ice Cold Gold: Iceland is very nice, but Greenland is full of ice—and gold, apparently. Ya hear us? GOOOOOOOOOOOLD! Lovestruck: The Musical (ABC, 8 p.m.): Airing too late to be considered for the TV Roundtable Reader’s Choice pick, here’s an ABC Family original that seems like a generic, all-singing, all-dancing generation-gap affair—until Jane Seymour drinks and potion and becomes 30 years younger. It might just be more baffling than that 7th Heaven musical. Remember Sunday (ABC, 9 p.m.): In which Alexis Bledel and Zachary Levi fall in love again and again and again and again—because one of them has short-term memory loss, see? It’s like the twee Memento! NBA Playoff: First round: Milwaukee at Miami (TNT, 7 p.m.): Miami lost only four games at home during the regular season—not a good sign for a Milwaukee team entering the playoffs after losing 12 of its last 16 games. This is not the series to pin your hopes of a Heat humbling.